Rarely can you experience a more authentic part of a city than by viewing the street art. It’s a vibe that enables you to feel the heartbeat of a location. 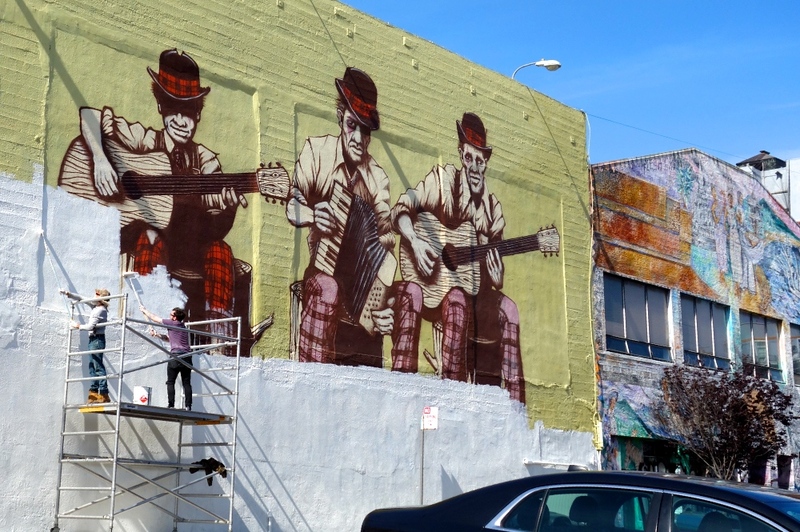 But as a traveler, do you know the best street-art locations in San Francisco, or where to find an authentic mural tour? Below is a quick list of thoroughfares you can walk for a glimpse of the San Francisco street-art scene. Balmy Alley is one of the main mural spots of San Francisco. Along the alley, instead of random acts of graffiti, you’ll see predominately volunteer murals, some more than 30 years old. 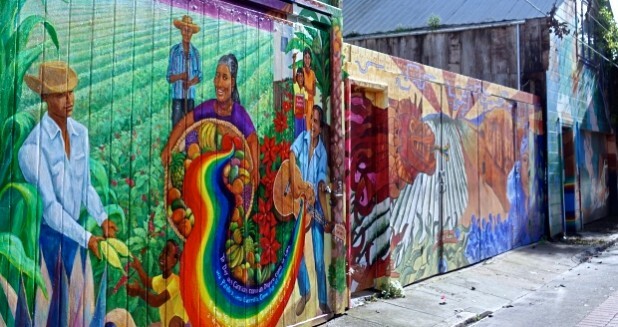 The mural environment includes Central American topics, murals celebrating the diversity of the neighborhood and art exposing the life in San Francisco. If you want a sunny, nice-weather walk, over a cup of coffee, with a friend, Balmy Alley is your spot. In addition to the murals, the alley is full of greenery and is generally a pleasant area to stroll. Precita Eyes Muralists, an inner city, community-based, non-profit mural arts organization and visitor center (which also gives classes and mural tours), is located on Harrison and 24th Street, close to Balmy Alley. 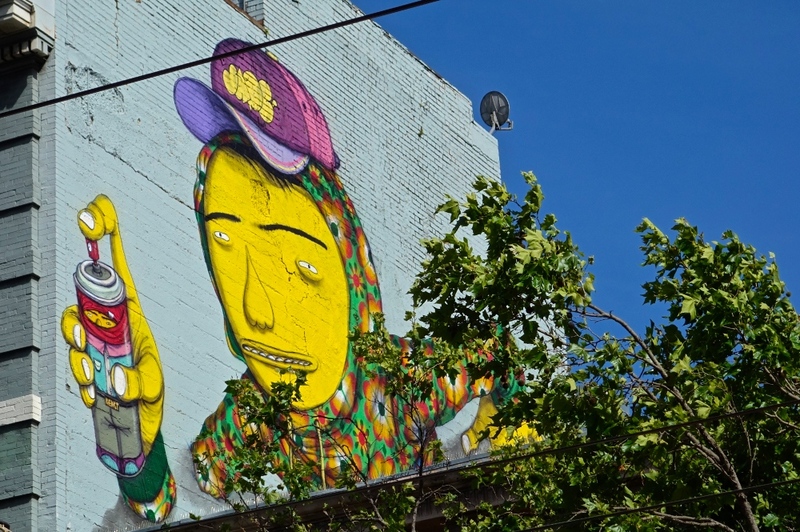 24th Street is a good spot for some flavor-of-the-culture art. 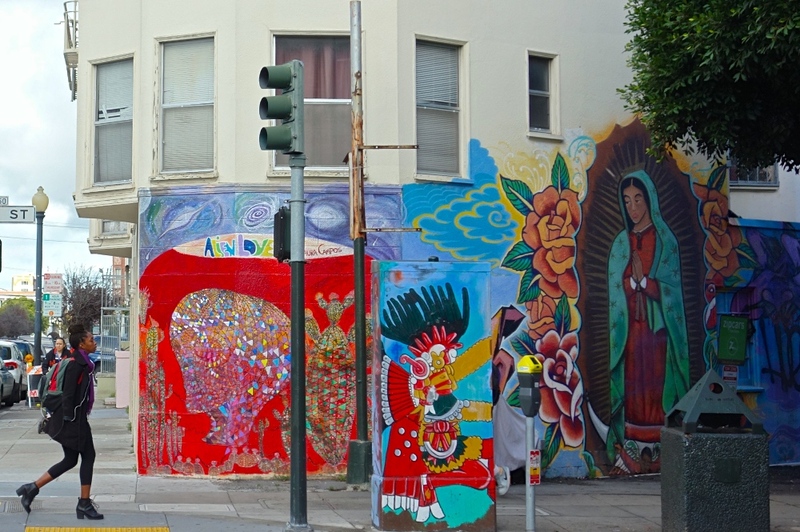 Off the main corridor, the area includes alleys (one of which is Balmy Alley) jetting off in most directions, displaying several types of murals, most representing the values and people of the Mission community. As you wander on 24th between Bryant and Valencia Streets, you can see drawings on light posts, utility boxes and spray-can murals. You also can sample authentic street tacos along 24th, as the street includes many taquerias lining the sidewalks. The art on 24th Street gives you an appreciation of the Central American community that helped form the San Francisco culture before the dot.com boom. Clarion Alley is a must-see. You don’t need to enjoy street art to appreciate the alley’s significance, specifically when it comes to understanding the locals of San Francisco. 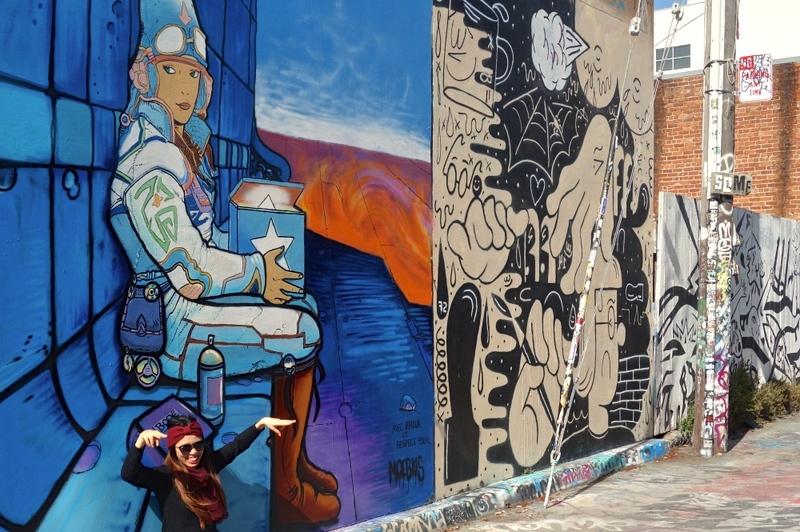 Several of the murals give you a hint into what’s really happening in S.F.—from the gentrification of neighborhoods such as the Mission (where Clarion Alley is located) to the ideas and ideals of the community, all in art. Clarion Alley is one of the most popular street-art alleys in the world. CAMP, the Clarion Alley Mural Project, is the non-profit organization formed to represent it. If you want a proper mural tour of Clarion Alley, please contact CAMP. Please help us identify this artist!! 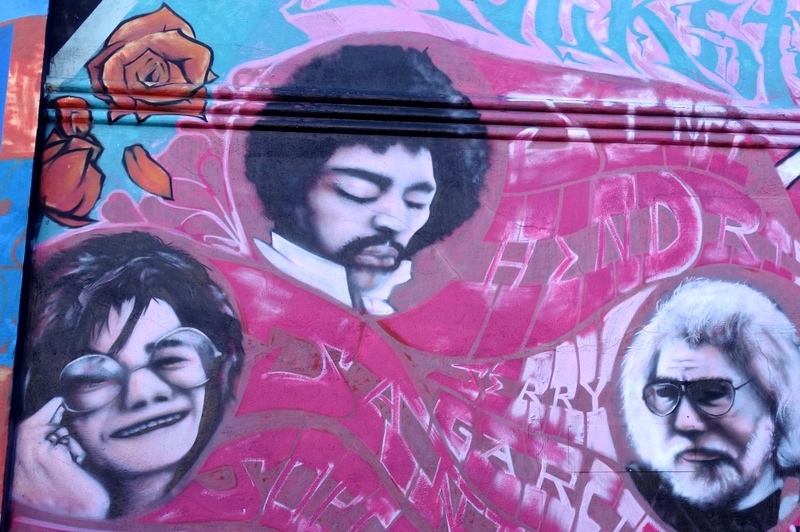 As Haight Street is the original hippie location of San Francisco, of course numerous murals are painted here. The main section, with the highest concentration of street art, is located between Golden Gate Park and Buena Vista Park, where you can see walls dedicated to music, original thought and the free spirit. Some of the artwork is strange in The Haight, which is a good metaphor for the neighborhood as a whole. Several coffee shops and restaurants line the street if you need to take a break during your stroll. Lower Haight, a more local section of the neighborhood located just a few blocks away, also boasts good street art. Although more of a nightlife spot in San Francisco, Polk Street includes murals lining the street from Ellis to Sacramento Street. Some people argue the Mission has better artwork and is more concentrated than Polk Street (true), but we already mentioned the Mission District 3 times—why not give another spot a chance? The murals might be far and few between on Polk, but you can see many on the way to a bar or restaurant, which is easy for a traveler with limited time. Most of the street art on Polk is located in the side alleyways. Note: The Tenderloin is a good neighborhood for street art, but Polk Street is one of the more popular streets in the neighborhood to walk, especially at night. Market Street is the main thoroughfare of San Francisco; busses, trains and streetcars all use the corridor. And more likely than not, you will, too. If you keep your eyes open, you can see some awesome street art along the way. Located mainly near the vibrant community art shops of 1st Amendment and The Luggage Store Gallery, Market St. and its side streets can show you some hidden pieces of art in random spots. At night, when most of the storefronts close, you’ll notice that many of the security doors are artistically adorned. Market Street might be busy, but with proper walking, you can absorb the artwork slowly. Tenderloin National Forest: a dab of garden-fresh scenery in the middle of a downtown environment. Not an actual National Park, it’s a small, lockable alley in the Tenderloin neighborhood. 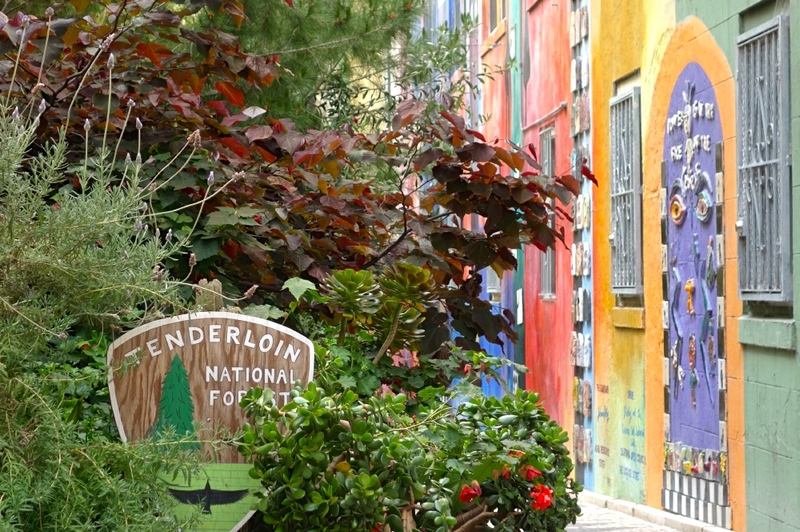 Packed with trees, a walkway and street art, Tenderloin National Forest offers an escape from the chaos of downtown San Francisco. And if you arrive at the correct time, the doors are open for your enjoyment. Unfortunately, though, Tenderloin National Forest isn’t open every day of the week…yet. But if you arrive at the right time, the place is legit. For donations to keep Tenderloin National Forest open more, contact The Luggage Store. We know this isn’t the end-all list of street art in San Francisco. Rather, we tried to tailor the selections to meet a normal person sightseeing in the city—someone who’s here briefly but still wants to appreciate street art. If in any way we offended you or didn’t represent your pieces correctly, please contact us. All pictured murals and artwork remain the copyright of the respective artists. Much of the artwork is under protective copyrights, but we don’t want to discourage ANYONE from seeing the murals. If you’re up for adventure in San Francisco—and to see some really cool artwork—keep these locations in mind. It can help you understand the culture of San Francisco a little more.